Mining around 1852 was carried out with quite simple methods. The pits followed mostly narrow veins with very high metal content for today's standards. Unfortunately, the vein deposits were very narrow (partly less than 1 metre), which led to a rapid deepening of the mines. However, the ore content often decreased rapidly towards depth. The length of the deposits was limited by geological conditions, or other owners were simply active there. 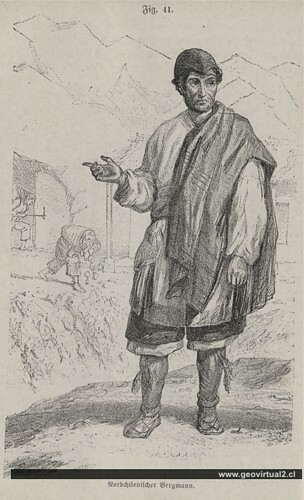 Gilliss (1849 to 1855) also describes the working conditions in the mines - but in Chañarcillo (see here). See also the description of the work of the apires and barreteros in the mines of Chañarcillo. Sections from Treutler 15 years in South America: Description of a visit to the Salvadora Mine in Tres Puntas (Atacama, Chile): The text refers to the years 1851 to 1856, but it should be mentioned that Paul Treutler's descriptions are not always authentic. "To get to know the inside of the pit, I went down into the pit with the steward at the entrance ramp. It was zigzagged and about 350 feet (=108 m) deep. The richest limestone pathway was 4 1/2 feet (=1.40m) thick, running from north to south, at a difference of 15°, and often in this thickness consisted of almost pure silver. I saw blocks of them lying on the ground, weighing in at 6 Ztr. (=300 Kg) and which were cut with the axe in order to get them out. 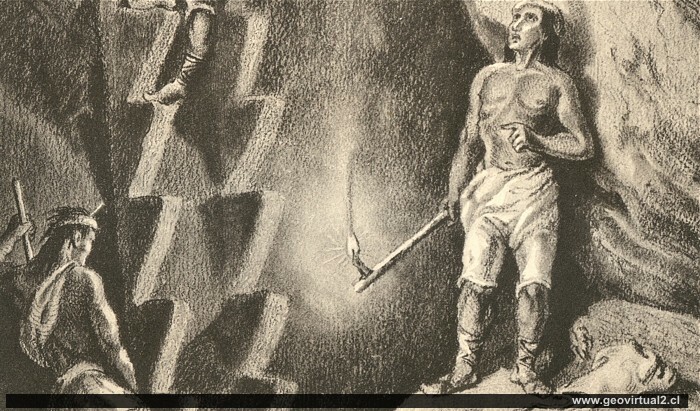 The lighting was provided by tallow candles; each miner brought one of them to the top of his cane. Everyone worked almost naked. Not only could I admire the great power and muscle strength of the miners, which often led 25 to 30 strokes in a row without resting, with a 25 pound (12.5 kg) hammer. No less than the pickmen the barrow-men attracted my attention, who with a leather bag, in which they carried 1 1/2 hundred kilograms (75 kg) of ore, often climbed 900 feet (279 m) quite steeply singing up and in 24 hours this tour on twelve times. As with the heels, the arm muscles, the calves were herculean. The working time was not in specific hours, but alternated between the pickmen and the barrow-men. After the first one had done his work, which consisted of drilling and blasting, he stepped down and left the working to the barrow-men, who brought the blown up ores and rocks to the surface, and when the place had been cleared, the pickmen, began his activity again. So this was an uninterrupted, day and night, week after week during work. The construction of the mine was very simple and appropriate to the conditions; it was completely dry, had no trunk of wood needed and had good air. The tracks were 6 feet (1.86m) high and 5 feet (1.55 m) wide. 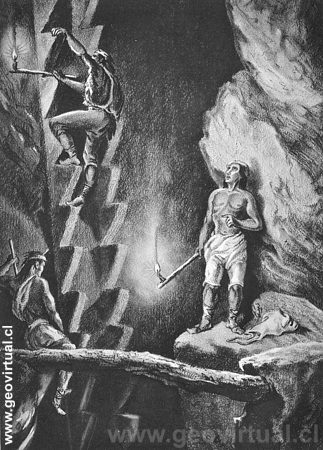 Up to now, all ore was put in bags on the back of the barrow-men to go way out to surface (#1); however, a vertical shaft had already been sunk to the deepest level and a horse-capstan(#2) had to be erected in order to extract the ores from it". #1) More horizontal, more or less passable tunnels entrances and exits. #2) Horse-capstan: Device for extracting ores from the shaft with horsepower. In most cases it was a turnstile with two horses, which were used to pull up a rope or a steel chain with a transport box. (For example, horse-capstan in Johanngeorgenstadt.